Love this print! Tiny little hand drawn arrow head shapes with a hand stitched effect coloring in twilight blue, teal, yellow, and more on a cotton jersey rayon blend knit. Fabric has a good stretch, fluid drape, and is lighter to mid weight. 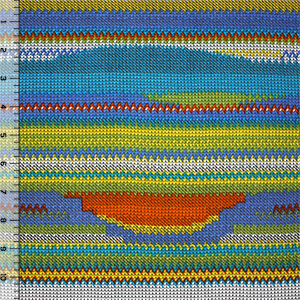 Pattern repeat is 24 1/2" (see image for scale).